This unit is 22 feet long! I built it for my daughter’s bonus room, which was once a garage. The installation was challenging because the floor actually slopes noticeably toward the left. I shot a level line and installed the boxes to that line, then supported the fronts with T-blocks made from 2×4 scraps hidden behind the toe board. All the doors and drawer fronts were purchased from a custom cabinet company. The bench in the middle is stationary and holds 2 large drawers. The end cabinet of each end is set back a few inches to save floor space in the corners and visually this helps keep the unit from seeming too imposing in the room. The top is plywood stained ebony with several coats of polyurethane. 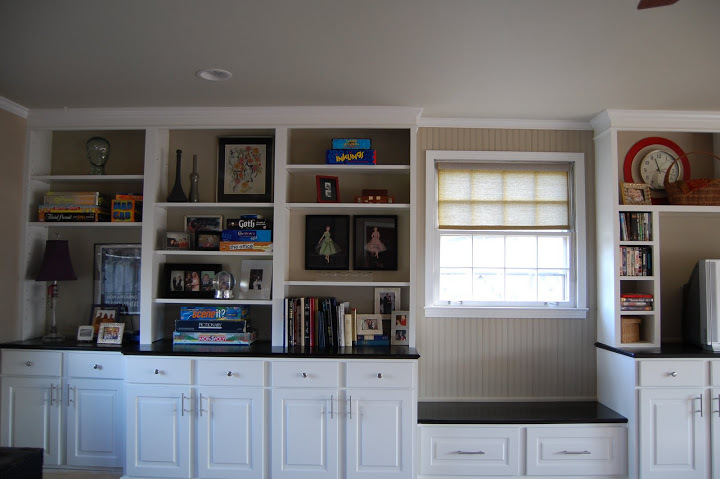 Crown molding around the top and beadboard around the window completes the built-in look.